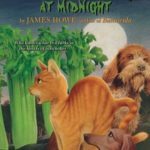 Of all the BUNNICULA books this supposedly final (another book came along years later) book in the series is probably the most forgettable. Yes, I know, sad right? 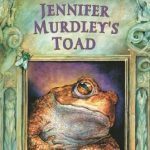 But of each of the other books in the series I have very specific memories, moments that made me feel this or that emotion. This book is connected to none of those feelings. It just exists. This adventure of Harold, Chester, and Howie just sort of wraps up a few things. 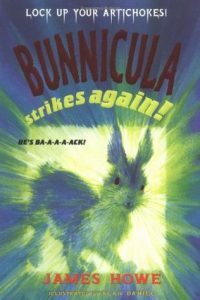 You meet some old characters again, Chester is up to his old tricks, and Bunnicula is mostly being the boring rabbit he seems to be. Except when he’s not. But it’s nothing we haven’t already seen in CELERY STALKS and is probably the most filler of any of the books. Mostly I just enjoyed the interactions with Felony and Miss Demeanor, as I always do. They’re hilarious. That’s the thing that save this book from being truly dull. 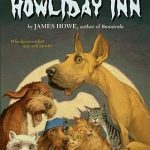 Howe’s humor is always there to save the day and his understanding of the personalities of animals is unparalleled. 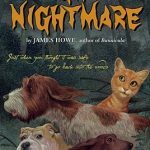 His cats are very much cats, and the dog absolutely dog like in every way. Each one is different but very much their breeds. And yet oh so human. Even though I didn’t care as much for this book I was so sad that the series was ending back in the day. 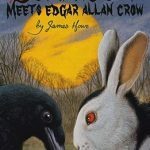 Little did I know that another book, BUNNICULA MEETS EDGAR ALLAN CROW, was on the horizon. It was a much better series ender than this. But this is still good for the occasional read when you’re marathoning the whole series. What series ender disappointed you? Share it the comments.